Do not fear. Iris are shipped when dormant. They are safe and healthy. They’ll look much like those in the first picture – the fans (leaves) will be trimmed to prevent dehydration, and the rhizomes – the tuber part – will be dry. You won’t see the kind of roots you would with, say, a zinnia plant, and that’s okay. The roots you DO see will act as anchors while your iris get established, and will hold the plant upright until new roots form. A few weeks after planting, you can tug gently on the fans and you’ll feel resistance – that’s how you know the new roots are forming. New leaves won’t form until after the new roots are getting nourishment for the plant. You won’t see new leaves for some time. Iris prefer well drained soil, and don’t like to get their feet wet; they dislike standing water. The soil does not have to be particularly rich. 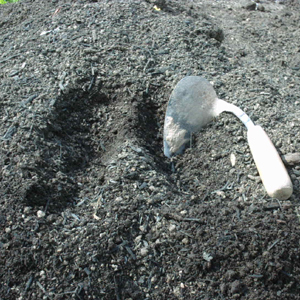 We amend our soil with a sprinkling of bone meal at planting time, and work in some compost when we redo a bed. If we remember when we’re at the farm supply store, we pick up a bag of 5-10-10 fertilizer in the spring – iris prefer a low-nitrogen fertilizer. But sometimes we forget, and frankly, the iris don’t seem to hold it against us. 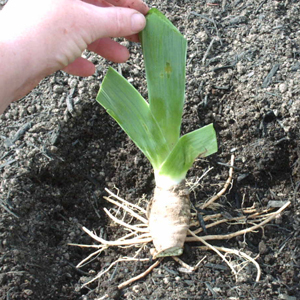 The rhizome will be just barely under the soil surface – it’s okay if you can see the top of the rhizome, or it can be very lightly covered with soil. Iris do not want mulch around them. I've always tried to give clear and concise planting instructions, but I can't possibly beat the description given by an online friend, Marsha from Marquette, MI. Marsha says that correctly planted iris should look like 'middle aged ladies in bikinis, floating in the water.' Try as I might, I can't describe the process any better! Keep a bit of the rhizome above ground where the sun can warm it, and the iris will thank you. 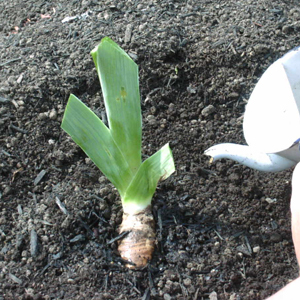 Fill in soil around the roots, tamping it down with your hand to remove air pockets, and give the iris a good soak, being careful that it remains upright. Your happily planted iris should look like the one in the fourth picture. 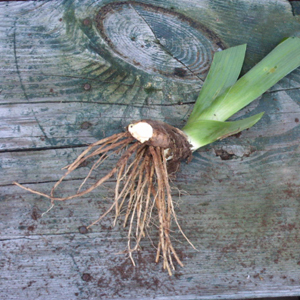 The rhizome is just barely visible, the plant is upright and watered. By blooming season next year, your non-gardening spouse will be converted.